I'm totally with you on the importance and urgency of maintaining NIH funding for research, but I won't buy the argument that it's just "partisan fighting". That's rather like reporters who refer to outright scam treatments as "controversial". It is republicans who refuse to bring things to votes and many of the core (tea party) obstructionists don't give a damn about science or research (think Michelle Bachmann). This farce will continue until we rid the House of fundamentalist extremists who, frankly, don't have a real brain between the lot of them. Two parties is great, loyal opposition is important, INFORMED argument is essential, but what we have is far from any of that. I'm not putting democrats on any sort of pedestal of intellectual virtue, but they do tend more to asking for and accepting expert opinion. Janet, I sympathize with your point, but many Republicans (most, I would argue) are highly supportive of medical research. Even the obstructionists, as irresponsible as they are, will probably change their tune as soon as they, or someone they care about, is in need of critical medical care - for cancer, heart disease, or any of the many other things that affect all of us some day. So I don't want to blame anyone for the NIH funding crisis. I just want them all to act responsibly and do their job, which is to set priorities and pass a budget each year. That is my point--nothing gets done because of blatant and ideologically based obstructionism--which is not coming from the left. I was speaking more broadly and including things like energy and climate change and I guess you were only referencing medical research. I think you are looking at it too narrowly and isolating medical research. If you are waiting for the tea party bunch to "act responsibly", I think you will have a long wait. One or two will come around when a relative suffers, as you said, but that won't get things moving any time soon. Portman came around on gay marriage in that vein, but I'd be surprised if that budges the party platform. Lastly, as a senior (egad...can't believe I typed that!) I don't want to trade social security for research, so I appreciate democrats not compromising my pathetic little check right down the toilet. If the only way we can pass a budget is to sell out old people, I think we need to find who is to blame rather than hope for a sudden turnaround of a party that thinks I and millions of other older women are a bunch of "takers" for not wanting our SS reduced in the name of a trumped up deficit "crisis". There is no reason we cannot do SS and medical research, but I'm pretty sure I'll be long gone before a significant number of Republicans see the light on the importance of basic science. Given the scale of disagreement on the large budget talks, I would like to see more effort towards specific budgets, not omnibus bills. The skeptic in me thinks that they prefer not to do this because they can't hide pork as easily. But I can see that they might view a small step like simply passing the NIH budget as not significant enough for their time. Also, I think scientists need to push harder on their friends/neighbors/representatives to understand that the NIH budget (or general science budget) is negligible compared to the overall US Budget, and that cutting it would not improve the debt picture at all. Unless they are cutting from the big three, nothing else really matters. While I believe that this whole situation is mostly a manufactured crisis for political purposes, and I certainly agree that a 10% across the board cut is foolish, and I totally agree that money given to NIH is money well spent, I'm squeamish at your assertion that "A 10% cut from the NIH budget would save 0.008% of the federal budget. This matters not a whit in the overall budget debate." It's the sorites paradox - no particular line item in the budget would make all that much difference if you fully funded it, but taken all together they would. One of the reasons we're in the budget situation we're in is there isn't any single item in the budget we can agree is over-funded - if there was, we'd have cut it by now. Arguing "my piece is special, so we should fund it and leave the cuts to other pieces (i.e. the ones you guys like)" is basically why we're stuck in the situation we're in now. Perhaps changing the dialog from "which programs have greater than 50% approval to cut" to "which programs have greater than 50% approval to save" may help ease gridlock, but it's pushing it to say that funding one program at the (implicit) expense of another "matters not a whit". I don't agree that we're stuck because everyone is arguing to hang on to his piece. There are just 3 very large pieces (Soc Sec, medicare/medicaid, defense), and we have to cut those to make a dent in the deficit. We should either cut those, if we really think the deficit matters, or increase taxes to pay for them, or just run large deficits (which seemed just fine to Congress when George W Bush was President). This is a debate we are not having. But cutting science funding makes no difference to that non-debate. 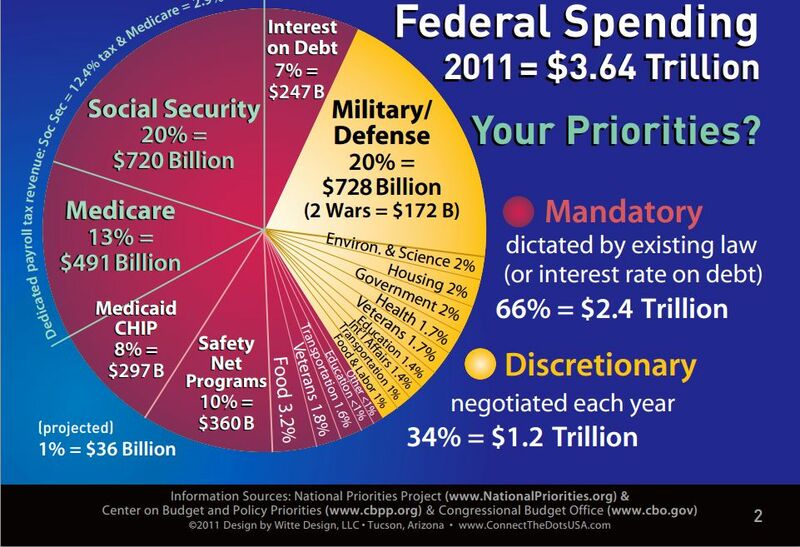 @RM - You are partly right: Each piece of discretionary spending makes up only a small portion of the overall budget. Even including defense spending, we're only up to about 1/3 of the budget ($1.2 trillion). Exclude defense, and it's only about $500 billion. The *deficit* is $1 trillion. 10% cuts it like trying to bail out the Titanic with a thimble. Maybe it helps you feel like you are doing something, but you're going to drown just as fast. In fact, since many of those discretionary funds (like NIH, NSF, health, transportation, education, etc.) actually *save* money in the long run, cutting them tends to actually *increase* the budget. So probably a better metaphor would be trying to save the Titanic by cutting more holes in the hull in order to "let the water out." I think the key here is that the consequences of cutting NIH funding in the long-term are likely more devastating than other areas. 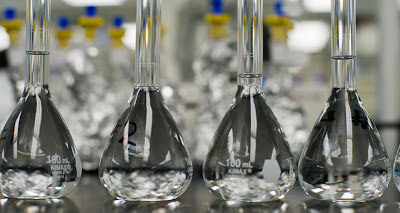 When an investigator has less money coming in, he or she cannot hire as many postdoctoral researchers, assistants, or technicians, and may not be able to support research for new graduate students. So not only may people leave for industry or another field, they might not have the opportunity to gain the valuable graduate research experience at all. Why put forth time and money in STEM initiatives if we are not willing to support the scientific careers and research? Furthermore, biomedical research programs don't function as on/off. If you cut funding for a time, it will several times longer to get back to where you started when the money starts flowing again. During that time we will have lost on countless new scientific discoveries and medical breakthroughs... Many of which save us (and the government) money by reducing severity or incidence of disease. If the government isn't going to drastically cut spending where it's needed, they should at least venture to keep the tax payers healthy so we can go on paying for it! I think there isn't much that we can really do to salvage the situation. What the congress has decided is most certainly going to be the final and only conclusion that the rest of us would have to abide to. It is really not something to look forward to because medical research is indeed a very important issue that we need to tackle immensely. Our lives depend on our health as a whole on a daily basis and that is part of medical research as well. If we are going to reduce the efforts or put a complete halt to it, then I am afraid everybody is going to be directly affected either on a small level or a huge scale.